Smoked Boston Pulled Pork... How I Got it Right! Bacon is one of my favorites – if it’s cooked right. However, I never liked cooking bacon as the fat always seems to love my face! I considered wearing a full face mask just to cook bacon. 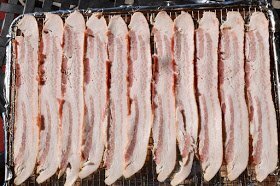 I started researching on different ways to cook bacon. Luckily, I found one method that suited our product launch! This is the best way to prove that our products are efficient and reliable – so I experimented. I headed over to the supermarket and bought thick bacon strips and turkey bacon. Excited, I went home and prepared the half sheet pan and cooling rack. I covered the half sheet pan with foil so that I can catch the fat and maybe use it to create gravy. I placed the cooling rack on top of it and laid the bacon strips. I set the oven temperature to 400F and set the timer for about 20-30 minutes. I checked it after 15 minutes-looks good! You know what’s great about this method? I NEVER turned the bacon! No more oil splatter, no lingering bacon smell, no oily gas range or pans to clean – just crispy, fat-free bacon to enjoy! Now, my family and I have bacon every day for breakfast. I can cook bacon while taking a shower or helping the children prepare for school. Cleaning the racks and pan are also easy. Just soaked those in warm water and dishwashing liquid for about 2 hours and hand wash them later on – no sweat! Why don’t you try cooking bacon this way? I assure you, they’re the best! Oh, and if you don’t have a baking pan and rack set yet, get yours now at www.kitchenatics.com!